Home / Beauty / How To Remove Dead Skin Naturally ? No matter what your skin type is, it is important to exfoliate the top dead layer of skin cells on a regular basis. Exfoliation will keep your skin soft and your pores clean. It will prevent any acne, blackheads, and whiteheads from cropping up too. There are many natural ways to do this in the comforts of your home. Read on to know more about it! One of the best things you can do to keep your skin looking fresh and glowing is to make exfoliation a regular part of your beauty regime. You may think that the CTM (cleansing, toning, and moisturizing) routine is enough to get a flawless skin. True! But in addition to that, exfoliating your skin is also important, and this applies not only to your face but also to your body. This is how exfoliation helps! Increase the quantities of the ingredients to use this on your body. Raw sugar works best to exfoliate the dead skin on the face and the body, as its texture is coarser and it can remove the dead skin cells with the friction it generates when scrubbed on the skin. The scrubbing action also improves circulation and makes your skin more supple and soft . Prick open the vitamin E capsule and add the oil present inside to the baking soda. Add a few drops of water to this and mix everything to get a paste with medium consistency. Apply this on damp face and scrub in circular motions for 2-3 minutes. The fine baking soda granules can easily remove the dead skin cells from your facial skin. Its alkalinity will help to dislodge the skin cells so that they can be easily shed off. 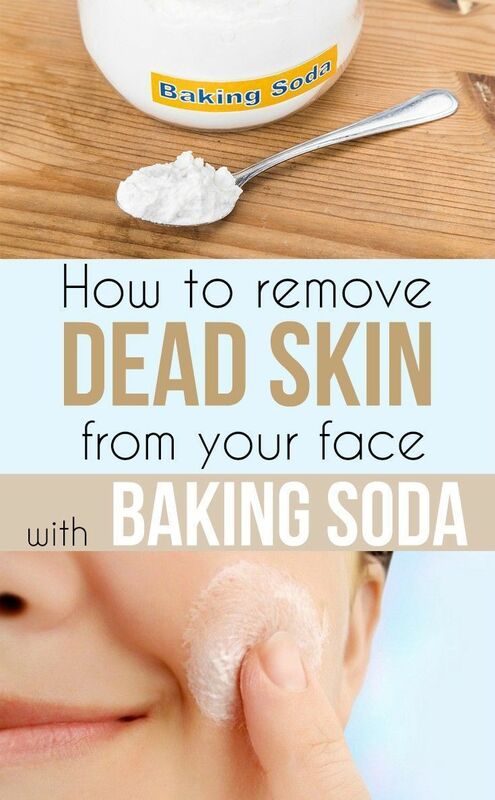 Baking soda also restores your skin’s pH balance . This can also be used to exfoliate dead skin from the lips. Both brown and white forms of sugar can help to exfoliate the skin. The honey in this mixture will help to moisturize your skin and also reverse the oxidative damage . Use this remedy to exfoliate dead skin cells on the arms and even other parts of the body. Combine the salt with the coconut oil and essential oil. Transfer this to an air-tight glass container. Use as much scrub as required for your entire body. Scrub gently for 2-3 minutes. Wash everything off using tepid water. Use this scrub once a week to exfoliate the dead skin on the body. The salt granules remove the dead skin when scrubbed gently on the skin. Epsom salt is also a wonderful detoxifying and pH balancing agent . Dilute the ACV with water and use the cotton ball to apply this on the face. Leave it on for 10-15 minutes and then rinse it off using cool water. To exfoliate dead skin on your feet, add half a cup of ACV to a tub filled with some water and soak your feet in this for 10-12 minutes. The acids present in ACV, such as acetic, lactic, and malic acid, dissolve the dead skin cells and these can be easily washed off with water . Diluted ACV can also be used to exfoliate dead skin on the scalp. Do not use this remedy if you have sensitive skin as the vinegar can sting.